Older people look like being more immune to swine flu. Due to exposure to long-ago active strains for influenza throughout the 20th century, it looks like people born before 1957 have some immunity to the swine flu virus. "The image above of the newly identified H1N1 influenza virus were taken in the CDC Influenza Laboratory"
Here is the World Health Organization's swine flu page (in English). "26 May 2009 -- As of 06:00 GMT, 26 May 2009, 46 countries have officially reported 12 954 cases of influenza A(H1N1) infection, including 92 deaths." 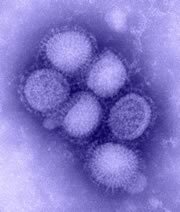 Here is the Center for Disease Control and Prevention (CDC) H1N1 page. Here is the Australian Government Department of Health and Ageing's page on swine flu. The story of the first trans-Atlantic telegraph cable. A bit over 5 minutes, but worth it. The Sydney Observatory. A great place for a family visit. On Saturday we took a trip to the Sydney Observatory which is now a museum of astronomy and a division of the Powerhouse Museum . Edward's cousins went there for a tour last week and told him about looking at the Sun through the big telescope. He was keen. It would also give me the opportunity to take some photos for my Sydney then and now ... photographic project. We knew that the first tour would start at 11am, so Saturday at 10.20am was a good time to look for a parking spot in Upper Fort Street, and we got the closest public parking space to the Observatory. I took a couple of important photographs for my project and then we went inside and read out some of the informational plaques to Edward along the way. This one explains the time ball. We went inside to the reception desk and booked ourselves into the 11am tour. Usually the fee is $7 for adults and $5 for children (from 4 to 15 years) but because we are members of a museum with reciprocal visiting rights at the Powerhouse Museum, for us it was FREE! Ed got a lot out of pressing the buttons on the interactive exhibits. We also walked through the gardens and admired the outstanding views afforded by the position of Observatory Hill. Then it was time for the 3-D movie show and the telescope viewing. The movies on show were Bigger than Big and After Stars both produced by Swinburne's Space Works. The old-school 3-D glasses were obligatory, and wearing them added to the fascination for Ed. Movies over and our knowledge of some facets of astronomy enriched, it was off to some telescope viewing led by our guide, Lisa. We ascended the narrow stairs to the southern dome and saw the auspiciously named Meade LX200 EMC telescope. I think this one is a 16-inch model, which is actually the same as used in the Meade company's own observatory. Lisa mounted a small ladder and started to manually turn the wheel to open the dome. You'll see here too a view of the cover on the end of the telescope. Whilst I'm sure it is of the highest quality, it does look as though it was made by Playschool presenters out of cardboard and sticky tape. We did not actually use the 16- inch telescope, we used a parrallel smaller telescope fitted with a filter. The filter on the telescope permitted direct viewing of the Sun, which would otherwise cause blinding to the viewer. I can't show the view through the eyepiece, but I can give you a good view of the bridge framed by the dome aperture. A tour of the grounds of the Observatory Hill reserve even revealed a war memorial of which I had been unaware. This one for the New South Wales contingent to the South African (Boer) War. It includes this small artillery piece which was manufactured by Fried. Krupp in 1896 at Essen. The visit to the Observatory sparked plenty of questions from Edward about black holes, pulsars and stars so today we borrowed some books on astronomy from the library. Edward got straight down to reading them when we got home. Here's the heritage listing for the Sydney Observatory which gives some good detail about the history of the buildings. The Australian Government's Bureau of Meteorology recently released its Annual Australian Climate Statement 2008. This gives in summary detail about our climate over the 2008 year regarding rainfall and temperature, especially in comparison to national averages, and in comparison to the period 1900 to 2008. It has received little attention in the Australian press so far. The national debate about climate change is so emotionally and politically charged that lest I be accused of quoting selectively to confirm my own biases on this, I simply encourage you to read it here for yourself. Since the actions to be taken by the Commonwealth Government on our behalf regarding the matter of climate change is likely to be one of the two most significant things this government does in the present term, we really need to be very well informed about the facts of the matter on climate change. 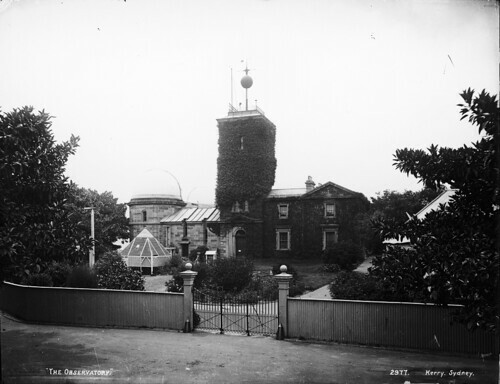 Sydney Observatory, originally uploaded by Powerhouse Museum Collection. I could not get to the same position as the original photographer because that place is now in the air above the Cahill Expressway Loop. The Sydney Observatory is now part of the Powerhouse Museum. Today we checked out the observatory, did the tour, and looked through the telescope and I'll blog more about that visit soon. Cassiopeia A: Chandra Discovers Relativistic Pinball Machine, originally uploaded by Smithsonian Institution. 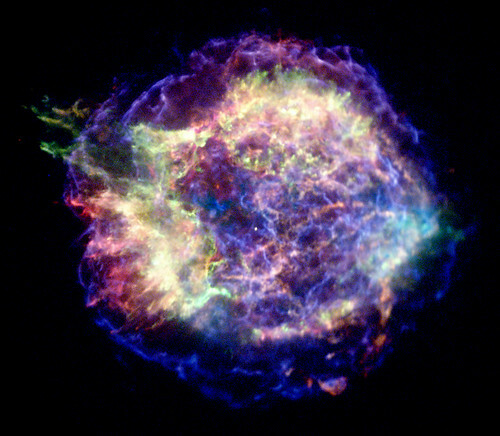 This photograph of Cassiopeia A is from "NASA's Chandra X-ray Observatory, which was launched and deployed by Space Shuttle Comlumbia on July 23, 1999." So it's a visually spectacular introduction to the International Year of Astronomy. Closer to home, I commend the website and blog of the Sydney Observatory. For old school stuff, I've got an especially soft spot for the Sydney Observatory's Historic Letters Blog. NASA also has a pretty cool site featuring the IYA here. "So Superman has holes in his cape!" Richard Edelman's own story of the diagnosis and treament of his prostate cancer. Very well written. AS would be expected, a model for communicating a very difficult personal topic.